Ohoopee Match Club is as private as private gets for a golf course. Ohoopee Match Club Cobbtown, Georgia 7,319 Yards, Par 72 As low-key private clubs go, this one’s nearly off the grid. Ohoopee Match Club is situated on the Ohoopee River in rural Georgia, 75 miles west of Savannah. It’s the quietly realized vision of Michael Walrath, a tech mogul and venture capitalist who thought it would be fun to create a place where he and his pals could enjoy match-play golf. In Hanse Golf Design, he found the perfect accomplice to execute that vision. Hanse peeled away layers of convention to craft a 22-hole layout atop a rolling, forested, lakeside property that was once an onion farm. Eighteen holes form the traditional layout; the extra holes, including a few that criss-cross each other—à la many ancient Scottish links—will be the basis of an alternate, par-69 “Whiskey Route” track of 5,600 yards that should be ideal for members seeking to walk a second round in a day. 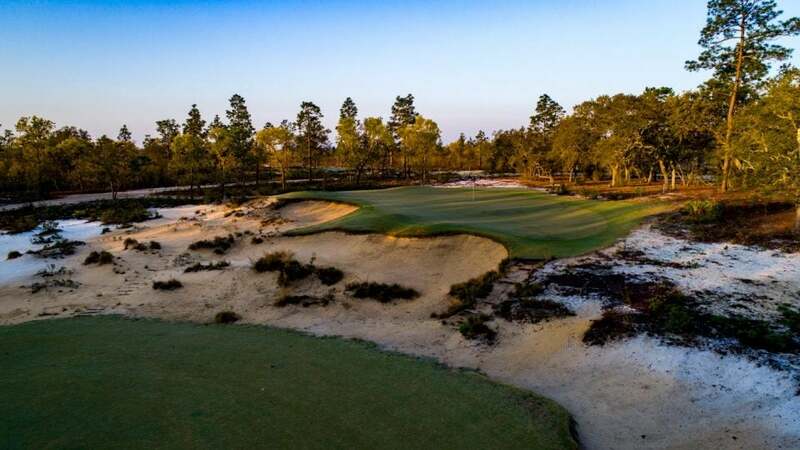 The course is bracketed by native sandy soil, scrubby vegetation and gorgeous live oaks, but it’s plenty wide to allow for multiple options off the tee. Artfully sculpted bunkers of all sizes, inspired contouring on and around the greens, and a good number of half-par holes provide Ohoopee with endless risk/reward opportunities, making it ideal for match play.